Back to more important things – pumpkin spice. Now that we have reached the middle of September, I’m on board with adding a few fall touches around the home and pulling out my fall spice blends. Bring on nutmeg, clove, and cinnamon! There is something about a slight chill in the air to make me want to curl up in a blanket, drink hot apple cider, and indulge in a sweet treat. 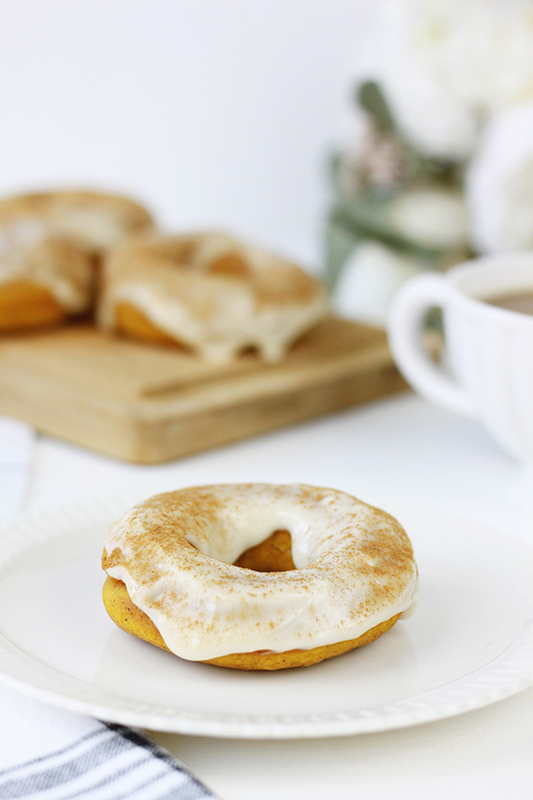 This time around, I treated us to a batch of baked pumpkin spice donuts with maple glaze. 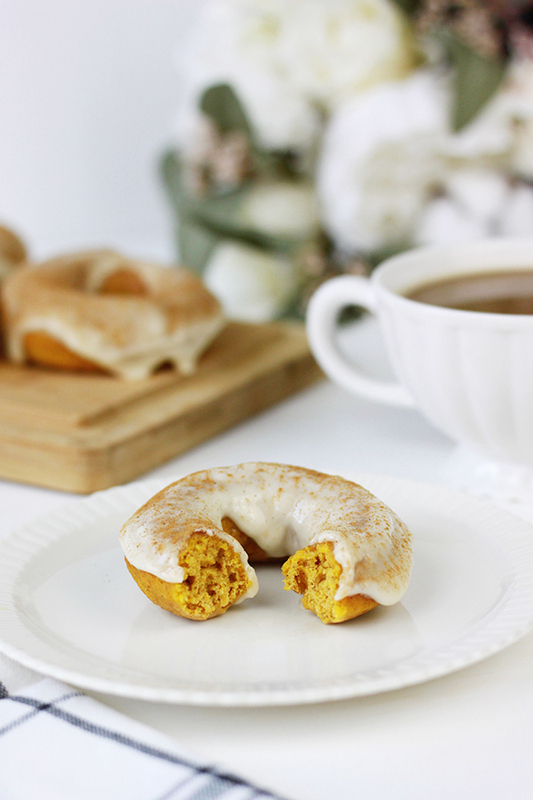 These pumpkin spice donuts are a great treat to bring to a school function, office party, or weekend brunch. They are quick and easy to make, but give the impression that you are a baking goddess. 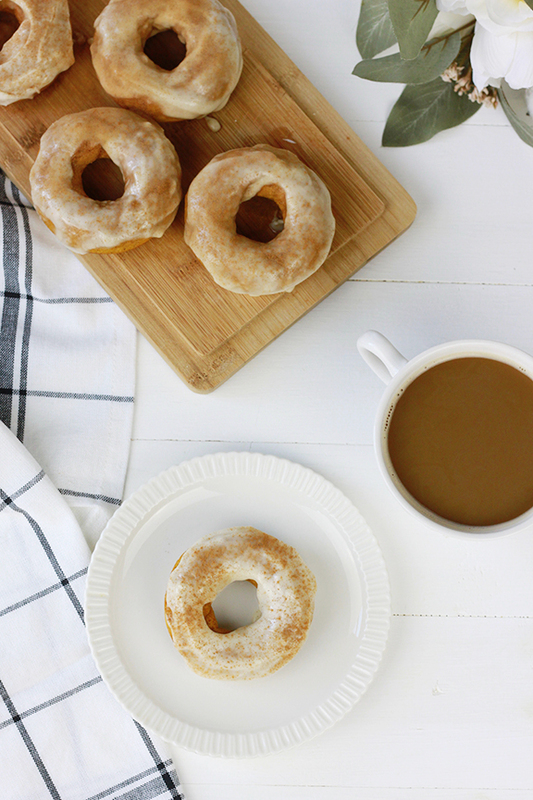 Homemade donuts?! How do you find the time! It will be our little secret that they are just as easy as making a batch of cupcakes! In a large mixing bowl, stir together the flour, baking powder, spices and salt. In a separate bowl, mix the pumpkin puree, honey, almond milk, egg and vanilla extract together. Add the wet ingredients into the dry ingredients and stir until combined. Spoon the donut mixture into a ziplock bag and snip one corner off. Use this bag to pipe the mixture into the donut tin. Place donuts in the oven to bake for 15-18 minutes. While the donuts are baking mix together the powdered sugar and maple syrup to form the glaze. Once the donuts are out of the oven and have had a chance to cool down, spread an even layer of maple glaze on each donut. Add a sprinkle of cinnamon on top and serve!